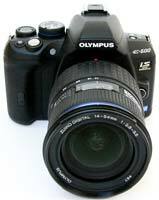 The Olympus E-600 is a new entry-level DSLR camera that offers most of the features of the E-620 model at a more affordable price. The E600 drops the backlit buttons, 3 art filters (Pale & Light Color, Light Tone, and Grainy Film), multi exposure mode and aspect mask control of the E-620, but retains all the other core features. These include a 12.3 megapixel Four Thirds sensor, image stabilisation system that's built into the camera body, free-angle 2.7 inch LCD screen, 7-point autofocus system, optical viewfinder with 95% field of view, Live View with high-speed contrast autofocus, 4fps continuous shooting and Supersonic Wave Filter dust protection. 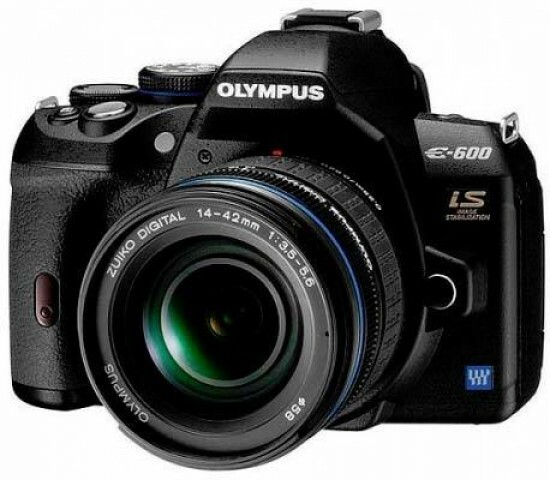 The Olympus E-600 DSLR officially costs $599.99 / £549.99 with the 14-42mm f3.5/5.6 Zuiko lens. The obvious markets for the more-compact-than-usual Four Thirds E-600 digital SLR from Olympus are the photo enthusiast, the creative of mind and those upgrading from either a starter DSLR, bridge camera or snapshot… that's basically those of us wanting regular DSLR quality, without the bulk of a camera based on an existing 35mmm SLR body sporting a APS-C sized sensor. See also the recent raft of Micro Four Thirds 'hybrid' cameras mining the same seam to an even more compact degree in the E-P1, E-P2, and Panasonic's GF1, G1, GH1. Despite how they might appear in press ads however, none of the above can yet claim to be small enough to fit in a pocket, trouser or jacket, so they're only more portable than a standard DSLR up to a point. Perhaps only Ricoh's new but yet-to-be-rated GXR - on which not only lens but also sensor is swappable - has to date come closest to a truly pocket sized interchangeable lens camera. Currently available in the UK exclusively through the Currys/Dixons retail group - where a body plus 14-42mm zoom was advertised for a very fair £399 at the time of writing - as well as across North America, the traditional SLR resembling E-600 is in effect, a slightly pared down version of the E-620. Or, if you like, it's an E-620 'lite', sitting below that camera yet above the entry level E-450 and E-520 in the range. So, when examining the E-600 in comparison to the E-620, it's as much a case of what you don't get as what you do. And, of those 'omissions', whether any are actual deal breakers. We were sent the camera not with the 14-42mm lens included in the current Curry's bundle deal but with the marginally broader focal range 14-54mm 1:2.8-3.5 II, equivalent to 28-108mm in 35mm film terms when married with the camera's Four Thirds sensor. While the core features have remained the same as the E-620 - 12.3 effective resolution from a 13.1MP megapixel Live Mos sensor, 2.7-inch, 230k dot free-angle HyperCrystal III LCD with Live View and 176° viewing angle, 7-point twin auto focus system, Supersonic Wave Filter dust reduction plus optical viewfinder with 95% field of view and approximately 0.96x magnification - when it comes to operation the E-600 has only half the six much-touted Art Filters colour effects of the E-620; the so-called 'digital darkroom in a box'. Retained on the E-600 are the trio of Pop Art (bright colors resembling children's poster paints), Pinhole camera (darkened edges of the frame) and Soft Focus filters, the first two being our particular favourites when it comes to in-camera effects - i.e the ones that are actually the most visually dynamic. Applying these three does however elongate writing times, as the effects are applied to the image in situ, a progress bar appearing briefly on the tilting LCD screen as the digital alchemy is taking place. Such effects are therefore best applied sparingly and will for most be viewed as fun extra rather than must have, making for pleasing results even if all that the user is really doing is pointing and shooting. Another key feature the E-600 has in common with its E-620 big brother is in-body sensor shift image stabilization with three selectable modes, and, like that model, qualifies as one of the world's smallest and lightest DSLRs sporting such a feature, since the likes of market leaders Canon and Nikon have famously opted to incorporate anti shake into their lenses instead. Further aiding shooting in lower light without flash is an ISO range stretching from ISO 100 to ISO 3200 inclusive in 15 incremental steps for an even finer degree of control than usually found at this level. On the subject of optics, the range of Olympus' own Four Thirds compatible Zuiko digital optics now stands at 20+ in number; nothing like the 60+ offered by Canon and Nikon for their equivalent models, but again more than sufficient for the E-600's target market. It will be interesting to see where Olympus (and Panasonic) place their future development emphasis however, should the newer Micro Four Thirds system capture the public's imagination in greater numbers. Could Four Thirds end up as an increasingly overlooked evolutionary stage, now there's something newer, shinier and sexier on the block in the mirror-less Micro Four Thirds cameras? Less obviously plastic-y than competing models and feeling solid and well constructed, the E-600's relatively diminutive dimensions (130x94x60mm) mean that it lacks a comfortably moulded grip as found on competing (if marginally larger) rival models. There is something resembling a grip provided, and it's better than Sony's entry level A230 provides, but it's still slightly narrow for our tastes. We had to dig our fingers inwards, claw-like for this DSLR to feel secure in our palm. The provided shoulder/neck strap helps of course, though we found it occasionally flapping across and obscuring the optical viewfinder when tilting the camera on its side to shoot portrait fashion; something to do with the eyelets for attaching the strap being on the top plate rather than slightly lower down on the sides. From the front the E-600 is unsurprisingly a dead ringer for the E-620, with a relatively uncluttered and therefore friendly looking fascia. Set into the grip near its base, is a self-timer lamp that flashes red as the camera counts down from two or 12 seconds. At the top of the forward sloping grip can be spied a dedicated exposure compensation button (a broader than average selectable +/- 5EV) and self-evident shutter release button with definite halfway 'bite' point, whilst tucked in between this and the lens mount is what claims to be a white balance sensor. We say claims, because from experience white balance performance can be somewhat unreliable across the Olympus range, varying between one shot and the next of the same subject, and under the same conditions. Across the other side of the lens mount - the right side, if viewing the camera lens on - are a lens release button, and that button alone in the absence of any switch for alternating between the likes of single and continuous capture as found on more 'grown up' models. Still, as we've noted, this makes for a clean, unfussy first impression that shouldn't dissuade beginners or those trading up to a DSLR for the first time. A small, manageable overall form factor however also necessitates a number of small buttons, on the top plate and particularly on the E-600's busy looking back plate, which require fingertip operation. Looking down on the camera the familiar looking raised shooting mode dial encircled by the on/off switch is the first thing to draw the photographer's attention. Flick the switch to on and after a wait of approximately a second and a half you're ready to begin shooting, the rear LCD providing a collective overview of currently selected shooting settings. Though this disappears after a few moments, should the user bring their eye immediately to the viewfinder the screen below doesn't automatically switch off; there are no built-in eye sensors as on Sony's Alpha range. Not a big deal, though we did find the glare of the screen momentarily distracting when shooting in lower light. Fortunately it can be flipped through 180° to face inwards to the body if it's surplus to requirements. 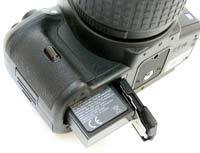 The options it displayed can be tabbed through using the arrow pad at the rear and/or the command wheel situated at the right hand corner of the E-600's top plate, where it falls easily under the thumb as the user grips the camera in both hands. Consecutively marked on the shooting dial are 11 options, including the standard creative quartet of program, aperture priority, shutter priority and manual shooting modes, plus full auto. The aforementioned art filters get their own setting shared with regular scene modes, plus there's pre-optimised settings for shooting portraits, landscapes, close ups, sports/action and night scenes. Select the art filters/scene mode setting, and, with a press of the right-hand key of the four-way command pad at the rear, access to the on board scene/subject modes is provided. Here we get options for photographing children, high key and low key effects for those looking to ape fashion photographers, a further digital image stabilisation mode plus 'nature macro' mode, along with candle, sunset, documents, panorama, fireworks, beach and snow, underwater wide and underwater macro options - the last two of course requiring additional waterproof housing for the E-600. What's here is happily well labeled and the myriad of dedicated buttons at least ensures users don't have to wade through several menu screens to adjust basics such as ISO, white balance and metering, all of which have their separate physical controls. As expected a dioptre adjustment wheel is provided next to the optical viewfinder, though its proximity to the shooting mode dial means it's difficult to actually operate. The visibility provided by the optical viewfinder is OK, if slightly murky for our tastes when compared to the best of what else is out there; especially when days are grey and overcast. Across the other side of the provided hotshoe for accessory flash nestling just behind the integral pop up flashbulb, we find two further dedicated controls in the form of small buttons; one for adjusting flash settings, the other a dual control for calling up self timer or continuous shooting options. The latter button also acts as a direct print control in playback mode, as well as a copy button, to transfer images from CF to xD within the camera. Again, a neat feature and one not expected on a DSLR in this price range. 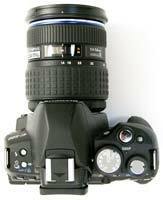 It's when using the LCD as an angle adjustable electronic viewfinder that Live View comes into its own on the E-600. Accessed via a press of the button displaying a TV screen-like icon to the right of the main LCD, after a brief moment the camera's internal mirror mechanism audibly flips out of the way and said monitor bursts into life. As indicated the LCD can be tilted and swiveled through 270° to afford more shooting opportunities and creative angles, as well as folded screen into the body for added protection when transporting the camera. With the E-600 like its recent forebears delivering lightning fast auto focus performance, for those looking to use whichever DSLR they're trading up to as a glorified point and shoot to begin with, this camera reduces the learning curve required. With a maximum burst mode of four frames per second for up to five Raw images or up to the available capacity of the card in use if shooting JPEG, plus face detection technology for up to eight faces in the frame, the E-600 once again matches the E-620 feature for feature. Captured images, whether unadulterated Raw or compressed JPEG are here rapidly committed to a choice of media cards - either CompactFlash (like 'grown up' DSLRs), or the less well traveled xD-Picture Card. The separate slots for both are hidden under a sliding door on the camera's right hand flank (if viewed from the back). 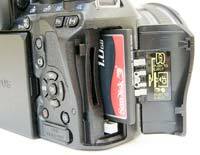 You can't help thinking that if Olympus didn't have a vested interest in the unloved xD, including the alternative of the more widely available SD/SDHC would have made much more sense. The main feature of the camera back is of course the aforementioned 2.7-inch LCD. While that's large enough for composition and review, and the resolution is just enough to achieve accurate manual focusing, it's tricky to check critical detail upon playback without using the command wheel to zoom in closer on images. Separate histograms are provided in this mode for each of the image's colour channels, which for a package costing less than £400 in total comes across as an overdose of riches. Top left of the adjustable screen is a small pairing of buttons for 'menu' and 'info'. The first is self explanatory, calling up a selection of user adjustable options spread across a quartet of folders - two containing image capture options, the third playback options and the forth your standard issue set up menu; all fairly straightforward stuff. The user friendliness continues over on the right hand side of the screen, with a joint auto exposure lock/auto focus lock button falling under the thumb top right of the LCD, and immediately below this another two buttons for playback and activating Live View respectively. Adjacent to these, located in the top right hand corner of the camera back are a button marked 'Fn' (function) to which various user settings can be attributed - including face detection and live preview, or perhaps just as usefully the ability to swap between JPEG and Raw capture without delving into the menu screens - plus a second button that enables the user to register a frequently used AF target as the 'home' position and so, if so desired, avoid the camera always biasing whatever's slap bang in the middle of the frame. Also located on the camera back, just below a padded indentation in the form of a thumb rest, we find a quartet of arrow keys with an 'OK' button at their centre for implementing whatever changes are made when scrolling through menu and function options. The arrow keys themselves allow manual adjustment of white balance, the user to switch from auto to manual focus and back again, choose from the E-600's incrementally broad range of ISO speeds and lastly, switch between digital ESP, centre weighted and spot metering. The final two buttons on the camera back, found just beneath, are a dedicated delete button highlighted with universal trashcan icon and three-option image stabilizer button; stabilizer on, active when panning horizontally, or when panning vertically. Despite the slightly busy layout, small size of some of the buttons and the fact they're quite close to one another, operation is fairly smooth and the controls as quick to respond as you'd expect, leaving the user to get on with the business of taking photographs. A rubber flap protects a joint port for attachment of a USB cable and AV out lead. With the base of the camera featuring a screw thread for a tripod mount and door with sliding lock protecting the battery compartment, again the E-600 ticks the expected boxes whilst giving the overall impression of being a solidly made, sound buy. Incidentally Olympus suggests battery life is good for 500 shots if using optical viewfinder rather than LCD with Live View for your compositions, which is fair without being overly impressive. In the two weeks we had the camera we found ourselves recharging it once. So, is Olympus' mid-range camera at an entry-level price too good a deal to be true? Let's examine the sample images produced and find out.